Home Geeky Lifestyle Harley Quinn and The Joker are not relationship goals. Harley Quinn and The Joker are not relationship goals. I want to start this off by saying that I all the opinions I express in this post are my own, I'm not trying to point fingers I'm just expressing an opinion. Now we have that out of the way I want to address something that I've seen growing all over social media that has made me feel a little uncomfortable and that is Harley Quinn and the joker being "goals". The word goals are something I've started to hate, the fact that people strive to have a relationship like certain couples is worrying. I would never want the same kind of relationship as another couple due to the simple fact that each relationship ship has their ups and downs and are unique to that couple. No one truly knows what happens behind closed doors. Good thing for us the world knows exactly what kind of relationship Harley and the joker have. For those of you who don't know who these are they are the character's from a DC comic book, there are a number of different comics by DC that they're featured in as well as the cartoons on TV, which I use to watch a lot as a kid. More recently Suicide Squad was released, to put it in simple terms they're bad guys put together in a squad to save everyone a bit like Marvels Avengers and DC justice league except the bad guys are the heroes. Originally know as Dr Harleen Frances Quinzel, Harley was a psychiatric intern at Arkham Asylum with high grades and a model student in college. Harley became very fascinated with a particular inmate (you guessed it The Joker) she was so fascinated that she wanted to analyze him, in order to do this she ended up pleading with the doctors for three months before they allowed her to treat him. Unfortunately for Harley, The Joker played with her emotions and ended up seducing her which caused her to fall madly in love with him. She eventually helped The Joker escape from Arkham Asylum and became The Jokers sidekick, Harley Quinn. Throughout their relationship together it became complex and one of the most twisted love affairs I've read about. The Joker already has a lot of control over Harley as it is and knows how to play with her emotions and feelings, he uses her feelings towards him as an advantage to get her to do whatever he wants. The Joker is a very manipulative and abusive partner, which brings me to the part of why I think these two aren't relationship goals; he has tried to kill poor Harley on a number of occasions, he beats her and plays with her mind constantly and she lets him because she is so madly in love with him. For a person to actually want a relationship like this I would find it very concerning, yes there are many cute pictures out there of the couple together that look loving but looks can be deceiving. 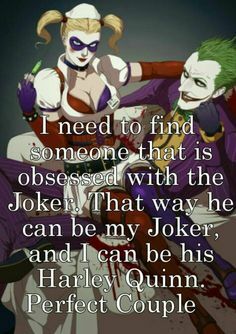 Harley has said a number of times how both she and The Joker and herself are just as crazy as each other, but to me, this sounds like she is making up excuses and stating that this is why they belong together. In abusive relationships, people do tend to make up excuses for their partner's behaviour and reasons as to why they should stay and it's pretty obvious that Harley is doing just that. All the signs point to them having an abusive relationship, in Harley's case The Joker abuses her in a number of different ways such as mental and physical and emotional abuse. For me personally, I don't find anything that screams "relationship goals" about their relationship, people as young as 13 are posting Meme's saying they would love to find a partner like The Joker or Harley Quinn. Both of these characters are batshit crazy, you don't have to be with an insane manipulative, abusive person for them to love you. I like Harley but that's not to say I like her when she is with The Joker, nor would I ever want to be her, I have nothing wrong with people jumping on the bandwagon when something is hyped up, life is about discovering new things so I wouldn't want to dampen someone's parade. 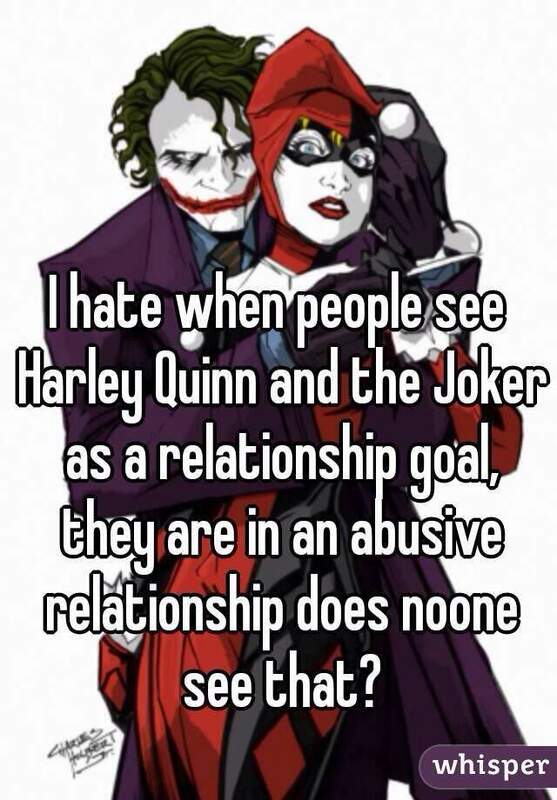 I just have a huge problem with people glorifying abuse in a relationship by saying it's goals. I've seen far too many of my friends share these memes and they get angry at me for telling them that an abusive relationship is not "goals" in the slightest. It's scary that people just see the relationship as two twisted people together and in love when there is so so much more to it than that. Though appropriately I have seen guys share this meme that I have known to be abusive in relationships (including my ex) which makes me wonder do these people realise they're the abusive one or do they see the abuse as just being of a romanticised twisted personality. But I wish people would stop, it's fair enough to like the dynamic between the characters but to see them as goals worries me! Most comic book couples are at the very least dysfunctional. Many of them are based on deceit (Superman, Spiderman, Batman). 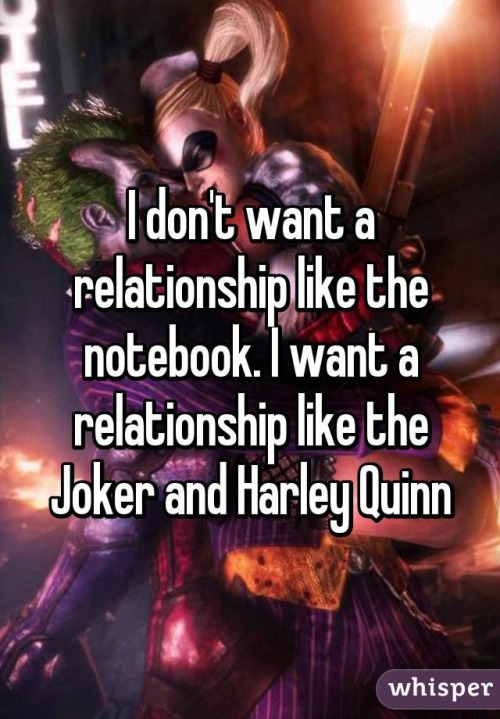 Joker and Harley are the antithesis of a healthy relationship.